Chase Building - Exterior - Front, n.d.
Chase Building - Exterior - Rear, n.d. 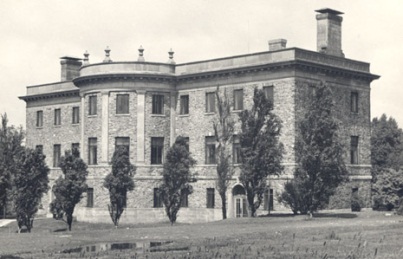 Designed by Halifax architect Andrew R. Cobb, who collaborated on the Macdonald Building, the University Club and Shirreff Hall, the land was donated by Dalhousie's Board of Governors to provide a home for the Public Archives of Nova Scotia. It was the first provincial archives building built in Canada. 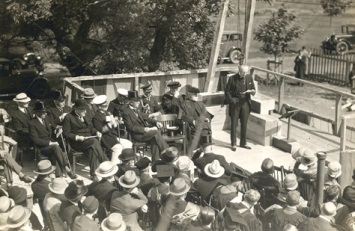 Funding came from longtime Board member William Henry Chase, who tried to remain an anonymous benefactor, but whose identity came out during the opening ceremonies of the building. The cornerstone of the Chase Building was laid on August 29, 1929, by Nova Scotia premier Edgar N. Rhodes. The building opened in January, 1931. Present at the official opening were: Premier Gordon Harrington; Lieutenant Governor Frank Stanfield; former premier E.N. Rhodes; Dalhouse President A.S. Mackenzie; A.G. Doughty, Dominion Archivist; and G.F. Pearson, Chairman of the Board of Governors. The Public Archives was lauded as a valuable addition to campus research facilities for Dalhousie students. Built with the latest features and materials, Cobb stated that the building was "absolutely unburnable." Its spacious and bright rooms were positively described, though over time, the ultraviolet light they admitted would fade the pictures and maps inside. In June 1980, the Public Archives moved to its larger and better-equipped building at the corner of University Avenue and Robie Street. In subsequent years the "Old Archives Building" was home to the Information Office (now External Relations), Development Office, Ecology Action Centre, Nova Scotia Confederation of University Faculty Associations, and graduate students' offices. Other tenants included a dance school, kayak fibreglassers, a theatre group, and the Nova Scotia Tattoo, which stored its costumes and props there. In 1985, the Chase Building underwent extensive interior renovations to refit it for the Mathematics, Statistics and Computing Science department. The $1.15 million project added fire stairs, carried out major electrical rewiring and built an underground tunnel to the Life Sciences Centre. 76 percent of the costs were covered by the province, the remainder supplied by the Campaign for Dalhousie funds. A rededication and renaming ceremony of the "new" Chase Building took place on April 1st and 2nd, 1986. Today the Chase Building remains the location of Dalhousie's Department of Mathematics and Statistics.